Ireland is world renowned for its dairy produce. Dairy foods include milk and a wide range of products made from milk. Walking through the refrigerated section of a supermarket will give a good indication of the massive variety of dairy products that are available. There are 1.4 million dairy cows in Ireland with 80 cows being the average herd size. 90% of Irish dairy produce is exported and our dairy herd accounts for 6% of all the dairy cows in Europe. Irish dairy cows live outside in fields all year and have access to fresh green grass every day which to account for the excellent quality of our milk. 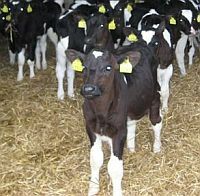 We have many placements available on dairy farms ranging in size from 50 to 500 cows. Work on these placements includes looking after cows and calves and milking. Many farms will calve during the early spring time, and this is an excellent time for students to get a great experience and learn a lot. Dairy farms offer students the chance to learn about the milking process and to compare the methods of an Irish farmer to those of their home country. Most dairy farms concentrate mainly on milk production but you may also be asked to do some tractor work and help look after any other farm animals.